Inspired by Gertrude Stein, Florine Stettheimer and others who hosted historic art salons, Suzy Spence has created S.S. Champlain in her sleek Brooklyn apartment (pictured at right). 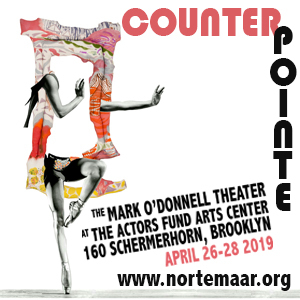 Named for the steamship that Gertrude Stein and Alice B. Toklas took from New York to Europe after Stein’s American book tour, S.S. Champlain presents new work by Leslie Brack through January 17. 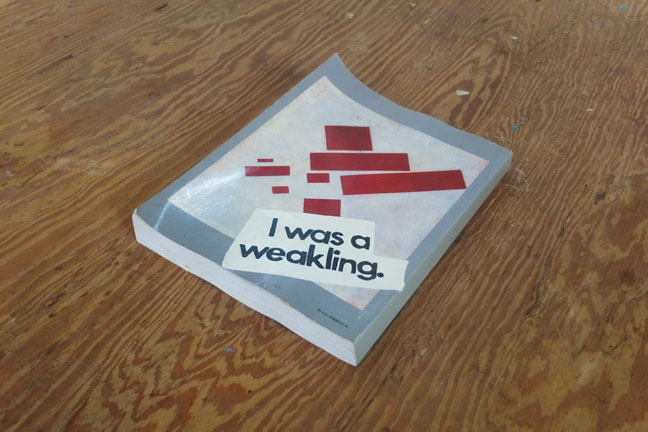 Leslie Brack, I Was a Weakling, 2012, oil paint on art book, 1 x 12 x 10 inches. At the opening on Saturday night, after a short conversation between Brack and filmmaker-artist Dave Dixon, an MC at Nuyrican Cafe and one of the organizers of the Moonlighter speaker series, the floor opened for a lively discussion of painting, digital imagery, advertising, and appropriation. Brack, who just returned from a residency at Yaddo and a six month stint in Rome, combines confessional text fragments and painted images that she has appropriated from 1970s magazines and art history books. Despite their often amusing juxtapositions, Brack’s intimate paintings evoke a palpable sense of loneliness, failure, and alienation. 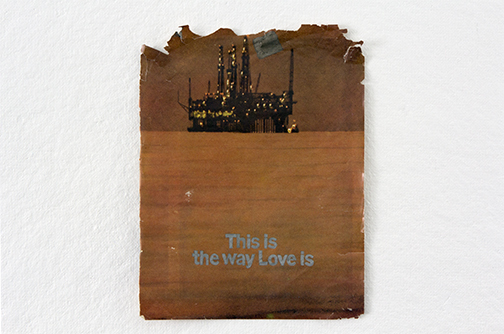 Recently she has begun painting text fragments on objects such as books and album covers, producing stealth art objects that seem to blend helplessly in with their surroundings. Leslie Brack, Oil Rig, 2012, acrylic on magazine page, 14 x 10.25 inches. 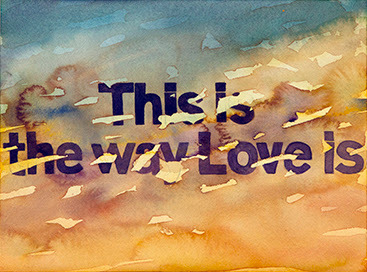 Leslie Brack, Torn Sunset, 2012, watercolor on paper, 9 x 12 inches. Leslie Brack, Sunset, oil on panel, 10 x 8 inches. 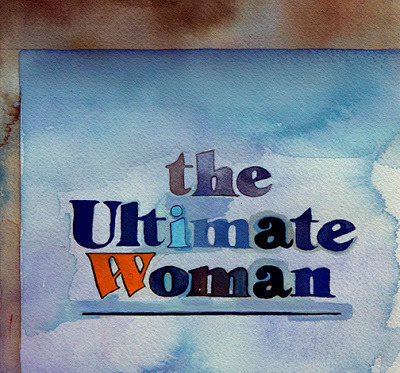 Leslie Brack, The Ultimate Woman, 2011, watercolor on paper, 7 x 8 inches. Leslie Brack, Spilled Drink, 2012, oil on canvas, 6 x 12 inches. 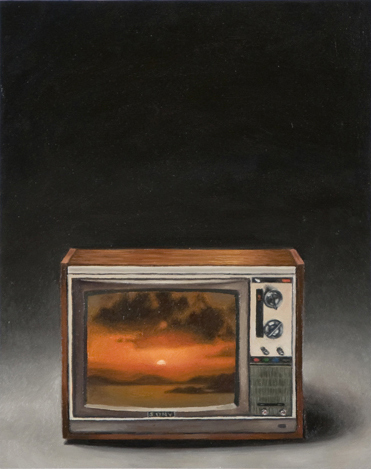 Leslie Brack, Clock, 2012, oil on linen, 8 x 8 inches. 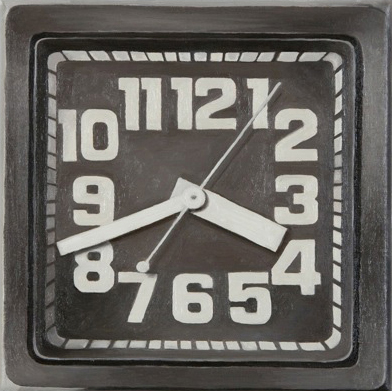 Brack says that clock images from the 1970s all have the hands set to a frown-like 3:40, whereas contemporary clock images lean toward a happier, smile-ier 10:10 setting. 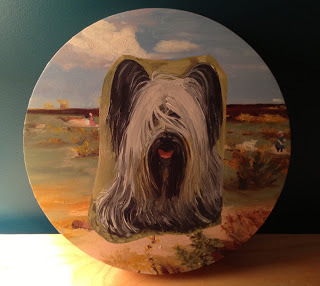 Installation view of a small tondo, 2012, oil on canvas. 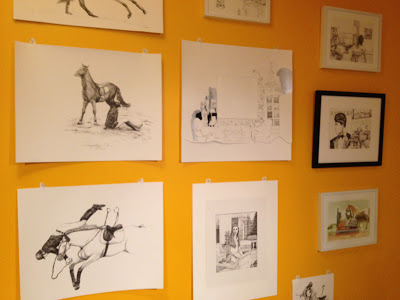 In the Salon des Refuses, a smaller project room that doubles as a studio, don’t miss Spence’s “Fallen Rider” drawings, created for her illustrated novel. “Leslie Brack: Kinda Verbal,” S.S. Champlain, Brooklyn, NY. Through January 17, 2013. Open by appointment. “Suzy Spence: Fallen Riders,” Salon des Refuses at S.S. Champlain. Through January 17, 2013. 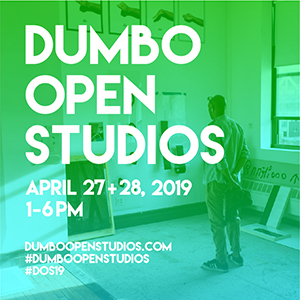 Open by appointment. Love the idea of salons with interesting artwork, inspiring discussions. Looks lovely! Love the intimate setting art. Hope she continues. Previous Previous post: The 4th Annual Degenerate Craft Fair! 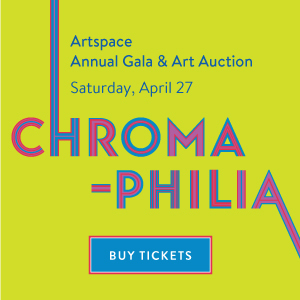 Next Next post: Seriously, what are Carroll Dunham’s paintings about?